Racing bicycle "Italia - America"
Steel frame for customized racing bike by Vincenzo Forgione: Custom Frame, with Columbus steel pipes, silver filet brazed, stainless steel interchangeable dropouts. 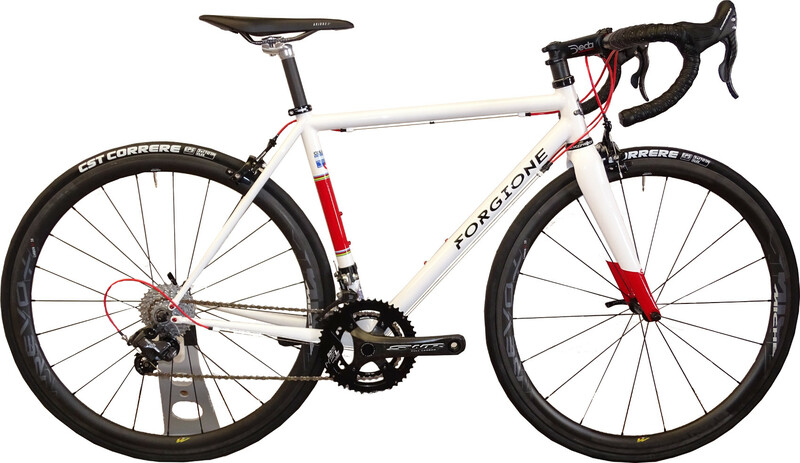 Bicicletta con telaio in acciaio su misura: "Rosso Italia 2018"
A racing bicycle with the Italian blood.The "Rosso Italia" is an idea of ​​realization for cyclists who love elegance and essentiality.Personalizable like all Forgione frames the "Rosso Italia" can be the starting point for your bicycle: an idea to design the right frame tailored for you. Here are the characteristics of this bicycle in the presented composition. The price refers to the complete bike as described below. Frame: Customized frame, with Columbus steel pipes, silver filet brazed, interchangeable dropouts in stainless steel. Price including assembly and shipping!